Second Hand (Used) DME master unit die holders (DME modular die sets) for Cold and Hot Chamber die casting applications. We have heavy duty, standard duty, single unit and double unit in available sizes 15x18, 12x15, 10x12 and many more. These units are available for quick delivery from our Waukegan, Illinois warehouse. Receive email alerts when new inventory matching DME become available? 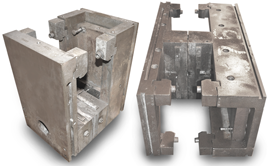 Related Categories: Cold Chamber Mag, Goosenecks, Cold Chamber, Tooling: Chill Blocks, etc. Recently Sold Listings in the dme category.